Lying in a perennial state of decay, Detroit’s Coleman A. Young International Airport is the subject of a fierce local debate over whether it should remain open or have its land converted for other uses. As the city continues its recovery from bankruptcy, Ross Davies looks into whether its future as an aviation hub can be truly justified. Detroit Airport has been allowed to fall into rack and ruin – an apt reflection of the city’s wider fate. Credit: Wikipedia / Russ Nelson. It’s hard to imagine that once upon a time Detroit’s Coleman A. Young International Airport was one of the US’s busiest hubs. This was at a time when Detroit held the proud moniker of Motor City on account of its production of automobiles for General Motors, Ford and Chrysler. Detroit was, of course, also famously home to the Motown music label. These were the halcyon days before Detroit’s infamous decline through the loss of hard industry and people – its population has declined by over 60% since 1951. The ultimate ignominy came in 2013 when the city was forced to file for bankruptcy thanks to years of debts and municipal mismanagement. In the meantime, Detroit Airport has been allowed to fall into rack and ruin – an apt reflection of the city’s wider fate – and it was notably included as an asset with the option to sell to cover Detroit’s debts during the bankruptcy filing five years ago. Both Southwest Airlines and Pro Air once operated Boeing 737s from the airfield, but today the airport has no scheduled passenger services, serving primarily private jets and corporate aviation. Such is Detroit Airport’s lowly standing, it doesn’t even have its own website, and its number of employees totals just 200. A debate has emerged in recent years over whether to keep the airport open or close it and repurpose the land – covering 264 acres – for non-aviation uses, such as an industrial park. Earlier this year, the city declined a $4m offer from private investors to construct a new terminal and hangars on the site. There are also question marks as to whether Detroit’s current mayor, Mike Duggan, and his administration, have sufficient appetite to keep the lights on at the airport. Suspicions were raised in April when reports surfaced that Duggan’s team had attempted to keep the lid on the findings of an independent study, which recommended that the airport remain an aviation hub. However, for Dave Tarrant, executive director of the Coleman A. Young International Airport Education Association, a group of local community leaders, the airport’s future should remain rooted in aviation. “We think those suggesting the entire property be turned over to industrial development were very uninformed about the value of aviation itself,” he says. The fundamental focus of the argument around Detroit Airport is what it can bring to Detroit’s local economy. Situated just six miles from downtown Detroit, its location is enviable. In a city that has suffered from a chronic shortage of decent properties, the land, some argue, is ripe for redevelopment. Despite this, Tarrant believes fresh investment in the existing infrastructure at Detroit Airport could play an intrinsic role in the city’s ongoing recovery, particularly in its downtown area where a new business district has started to thrive in recent years. “The airport is only seven quick minutes from the resurgent downtown and midtown areas, which are experiencing rapid rebirth,” he explains. 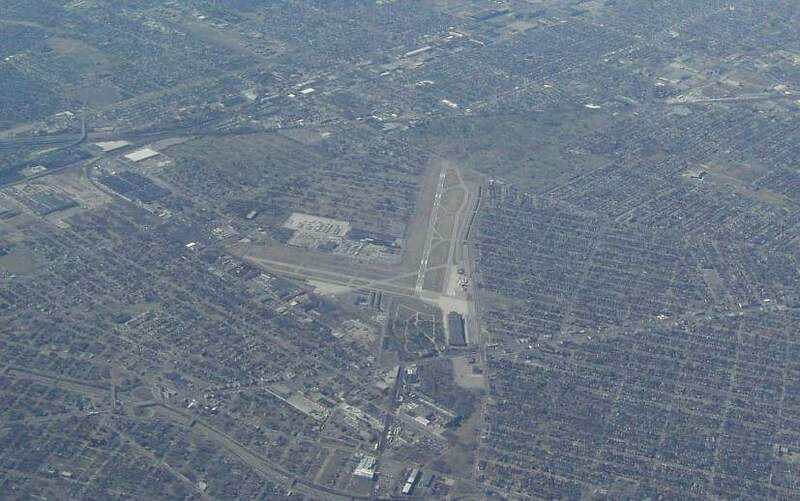 In many ways, the debate around Detroit Airport is indicative of a growing loss of smaller municipal airports in the US at the hands of budget cuts. According to the Aircraft Owners and Pilots Association, around 50 American airports close their doors for good each year. “The fate of airports in the United States is a sad state of affairs,” says Paul Freeman, who runs the online database Abandoned and Little-Known Airfields. A significant part of the problem, claims Freeman, is that local authorities have little appreciation of how and why smaller airports were funded in the first place. “Many airports in the US were built primarily with federal government funds, and local politicians often have absolutely no appreciation for how much money was invested in the aviation infrastructure that was gifted to them by the federal government,” he says. Back in Detroit, some of those in favour of revitalising its jaded airport advocate offering long-term leases to tenants that rent its hangars and other facilities. The Duggan administration has previously refused to countenance the idea of long-term leases, but to hear Tarrant tell it, there might be hope yet. “There are signs that the Duggan administration is moving toward a more rational understanding of the value of the airport,” he says. “Meantime, other political forces – such as City Council – are moving in the direction of creating a new governance structure to manage the airport.